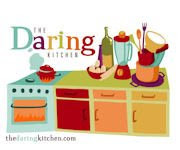 I was waiting with high anticaption for the first Daring Cooks' challenge from the Daring Kitchen..... two-and-a-half years after the birth of The Daring Bakers, Lis and Ivonne were happy to inaugurate The Daring Cooks with the first ever challenge! So to do away with the suspense, they were happy to announce that the very first Daring Cooks' challenge was... Ricotta Gnocchi! Fried lime infused dessert gnocchi served with blueberries and cream. They chose a recipe from the stunning cookbook by Judy Rodgers, named after her restaurant, The Zuni Café Cookbook. On the surface, this is a very straightforward recipe. The challenge is in the forming and handling of the gnocchi and what you do with the recipe, in terms of variations, was up to us. What a weird coincident I have been watching a few Australian cooking shows and all of have featured Ricotta Gnocchi and I decided to make this so this meant I had almost made it before the reveal I am letting the gnocchi rest for an hour at the moment! I just love the Synchronicity. I had organised a tasting party at my house for this new recipe and as usual I thought I'll try a few flavours to see what the gnocchi goes best with. 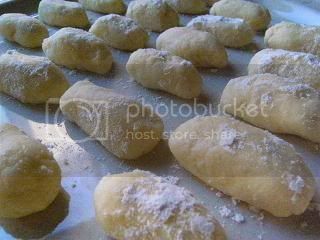 I found the easiest way to shape the gnocchi was to scoop out the mixture and very roughly clump it together without pressing and roll and shape it in the flour, this ensures a very light and open gnocchi. Surprisingly this gnocchi goes very well with strong and mild flavours it's very versatile. The texture of the cooked gnocchi is very open and light and the taste is a very mild ricotta flavour and the colour is very light yellow. It does swell to about half again and is a little lumpy which is appealing. The verdict these gnocchi are light cloud bursts of yummmmmm! So much better than the normal heavy potato gnocchi. I found to get max size increase was to use very hot water and let the gnocchi cook for about 8 mins this gave the biggest gain in size. I had no problems with them breaking apart since I used hot water and not simmering/boiling water. The gnocchi's shape improves when it is cooked. Make sure that you don't overmix the eggs before you place them into the ricotta mixture they will be mix correctly by the time you have finished adding and mixing all the other ingredients. I did small gnocchi only 1 teaspoon each and I got roughly 100 gnocchi from 500 grams ricotta I froze the leftovers. 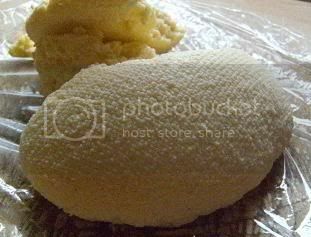 I made my own ricotta it is very simple and to dry it perfectly leave it overnight uncovered in a sieve over a bowl this makes it bone dry and push the cheese through a fine sieve this makes for a very light textured gnocchi. Mix the skim milk powder, cream and water it will form a thick liquid. Heat until it is very hot (not boiling) add the lemon juice. Stir gently once every minute for three minutes do not let the liquid boil. It should now be a mixture of curds and whey, let it cool about 15 mins or so. 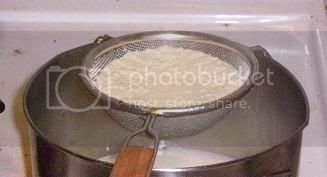 Strain using a very fine sieve place the sieve over a bowl and place into the refrigerator overnight uncovered. Since so little water is used the ricotta well be very dry when you want to use it. Push the cheese through a fine sieve when needed this adds lightness to the gnocchi mixture. A very easy challenge recipe that leads to a very stylish dinner meal. Also it is very very filling! I made three types since I couldn't decide – sweet chilli octopus, Avegolemono (Greek Lemon Egg Chicken Sage sauce), spinach and cheese. I liked all three! And two guests seemed to like the spinach and cheese and the last guest the sweet chilli octopus. Of course all the gnocchi was gone very quickly. 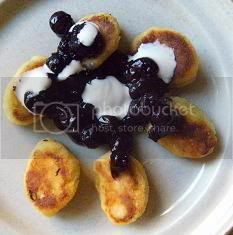 I also made fried lime infused sweet ricotta gnocchi with blueberries and cream. Here are the shaped gnocchi - I made home-made ricotta from skim milk powder (recipe above) but added sugar (instead of cheese) and lime juice and lime zest which makes the lime infused ricotta cheese. 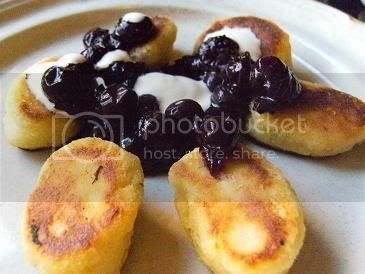 Fried sweet gnocchi is so nice and forms a very thin & crisp crust of a beautiful light brown colour and it goes well with canned blueberries and cream. They only take literally 90 secs each side. This is a very easy and very elegant dessert. I thought I would do another batch since they are so tasty and simple to make. The tri-flavoured gnocchi waiting to be cooked. Prep time: Step 1 will take 24 hours. Steps 2 through 4 will take approximately 1 hour. it is. Draining the ricotta will help your gnocchi tremendously. they look a bit wrinkled or if they're not perfectly smooth. you let them sit around too long they may become a bit sticky. 5. For the variations to the challenge recipe, please see the end of the recipe. Step 1 (the day before you make the gnocchi): Preparing the ricotta. Step 2 (the day you plan on eating the gnocchi): Making the gnocchi dough. 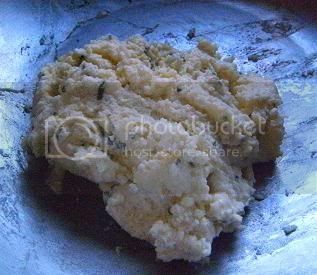 Add the lightly beaten eggs to the mashed ricotta. Melt the tablespoon of butter. As it melts, add in the sage if you’re using it. If not, just melt the butter and add it to the ricotta mixture. Add in any flavouring that you’re using (i.e., nutmeg, lemon zest, etc.). If you’re not using any particular flavouring, that’s fine. 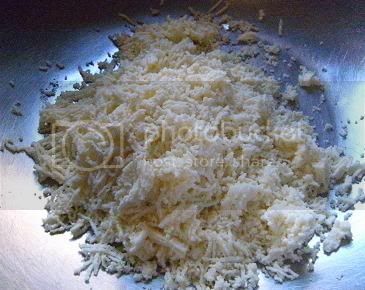 Add the Parmigiano-Reggiano and the salt. Have a large skillet ready to go. Place the butter and water for the sauce in the skillet and set aside. In the largest pan or pot that you have (make sure it’s side), bring at least 2 quarts of water to a boil (you can use as much as 3 quarts of water if your pot permits). You need a wide pot or pan so that your gnocchi won’t bump into each other and damage each other. Place the skillet over medium heat and melt the butter. Swirl it gently a few times as it melts. As soon as it melts and is incorporated with the water, turn off the heat. Your gnocchi should be cooked by now. With a slotted spoon, remove the gnocchi from the boiling water and gently drop into the butter sauce. Carefully roll in the sauce until coated. Serve immediately. Variations: For the gnocchi, you can flavour them however you wish. If you want to experiment by adding something to your gnocchi (i.e., caramelized onion, sundried tomato), feel free to do so. However, be forewarned, ricotta gnocchi are delicate and may not take well to elaborate additions. For the sauce, this is your chance to go nuts. Enjoy yourselves. Surprise us!!! Freezing the gnocchi: If you don’t want to cook your gnocchi right away or if you don’t want to cook all of them, you can make them and freeze them. Once they are formed and resting on the flour-dusted, lined tray, place them uncovered in the freezer. Leave them for several hours to freeze. Once frozen, place them in a plastic bag. Remove the air and seal the bag. Return to the freezer. 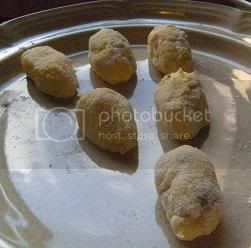 To cook frozen gnocchi, remove them from the bag and place individually on a plate or on a tray. Place in the refrigerator to thaw completely. Cook as directed for fresh gnocchi. They're all stunning, Audax, but I love the lime dessert gnocchi best. They llook so crispy on the outside---delicious! Thank-you so much for the ricotta recipe you posted in the forums at the beginning of the month. it is fantastic! Audax... Congrats on your first Darin Cook Challenge. Wow! 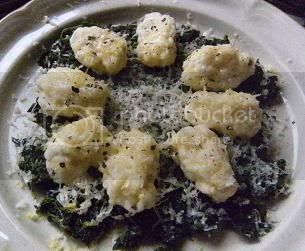 Great job on this challenge with homemade ricotta and all of the variations using the flavors with and in the gnocchi. Aud, your creativity, not to mention speediness, never cease to amaze me! You really do rock! All of your gnocchi preps look delicious and perfect! I'm willing to give a try to the sweet ones (talk me about lime-infused and I'll follow you everywhere!!). Just WOW! All those kinds of variations! Your gnocchi are fantastic and look extremely mouthwatering! Congrats on your first challenge as a daring Cook! Beautiful! And very ingenious to have thought of making them different colours and different cooking styles. Bravo! Wow! Your gnocchi look amazing!! All of the flavours and cooking methods you used sound divine =D. I love your sweet and savory versions of the gnocchi. I will have to try again and use some of your flavors next time. You really went all out and I think I would love each and every one of your variation. I have some truffle oil and really would love to try that one soon. And the avegolemono one is pure genius! The dessert one is a great idea as well. Maybe something like ricotta pancakes? Great job and beautiful photos! Wow! You are so creative! I don't think I could have come up with that many versions if I tried. They all sound delicious! i would just like to say that i think that you're brilliant. i think pretty much everyone seeing this is jealous of those who got to taste them. So fabulous! I love all of the flavors you made! I still remember how your gnocchi photos inspired me. You were the first one to post, once again. Both the savory and sweet versions are stunningly tasty looking. I learned a lot from you already. Thanks for sharing all of your experience and tips! Your creativity more than made up for my lack thereof. I am going to have to test out some of your flavour combinations!!! Wow, you really went all out! I built up the nerve to make ricotta because of you and all your posts on the DK website! Thanks so much! woww! once again you went all out on the gnocchis! Love all the variations you made... I especially would like the try the chili octopus gnocchis :D Great job! I can't believe all your variations, Audax! When you do it, you really rock it! I especially love that dessert version - just brilliant! What wonderful variations! 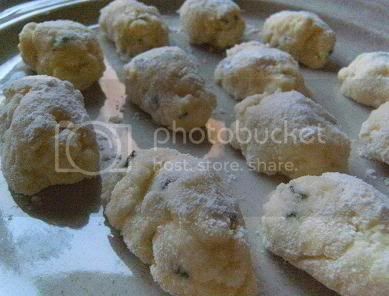 So many great ideas on flavorings I never considered for gnocchi before, and the desert gnocchi are so darling. I am going to try making the fresh ricotta next time. I'm spoiled by all the fresh ricotta I can buy here but your recipe looks so good! Have a nice Thursday ! Wow, your results are fantastic and ever so adventurous. I'm so impressed. Although my husband didn't care for the gnocchi, I quite enjoyed it (as well as the making of said gnocchi). As you put it, they are "light cloud bursts of yummmmmm". You've out done yourself on this challenge. I wish I had some of the sweet gnocchi to try tonight! I love how many different ways you came up with to serves these, especially the dessert!!! 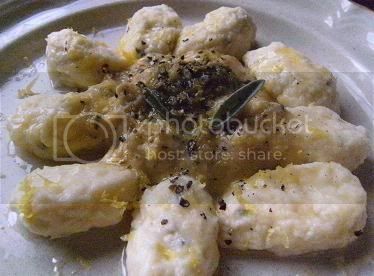 my gooooshhhhh Audax this looks and sounds soooo delicious I think I make these Gnocchi, i made ricotta ct home but using full milk, unfortunately skim milk powder is one of the products that desappeared from the supermarkets shelves (thanks to comunisim and our dictator). Well, I'm not the first to say it and I'm sure I won't be the last, but WOW! All your gnocchi look amazing, but I'd love to try the octopus! That's a gnocchi presentation you don't see every day. Thanks so much for visiting my blog. Lovely, all of them! Amazing job! wow, you were very busy in your kitchen making all those differnet types of gnocchi - i stuck to one and feel v inadequate as aresult! You inspire me. I have some truffle oil, so I will definetely try this version next time! love that you turned this recipe into a dessert- great job! What wonderful flavors! The truffle oil especially is a great idea!! Gnocchi looks wonderful, you have made so many variations ! I'm really impressed with all the flavors you created. What an incentive! I'm wondering if the method of making the ricotta might affect its moisture content. Perhaps it's time to use the scientific method and test the various recipes. Wow you're an inspiration to the rest of us Daring Cooks! You never cease to amaze me with your zealour baking and cooking. I love it. I love the enthusiasm you seem to have for life! 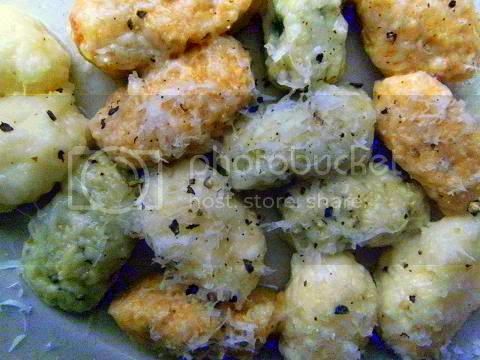 I love the pic of the multi colored gnocchi with cheese. Beautiful. You did an amazing job. Your post makes me want to give this gnocchi a try again. Wow, you really rocked the gnocchi! Well done! Truffle oil and roasted red bell pepper both sound delicious! You got so creative. They all look beautiful... and tasty! tricolori gnocchi! why didn't i think of that?! so simple, so smart. they look awesome. thank you for stopping by my blog and for the sweet comment. I really want to try frying the gnocchi!! Thank you so much for all your input on the DC forum!! You are awesome! Your flavor combinations are like poetry! Your post is fabulous, and even though I'm thousands of miles away, I feel like I'm a guest at your tasting party. Thanks for that, and beautiful job. Yum! I think I'll need to try the sweet version and I'm glad to have read the blog to read about the sugar/cheese substitution. You're one of my favorite daring baker/cook posters! Always great shots and always so full of information and tips! Keep on rockin! Thanks for stopping by my blog, oh you're the little cloud of heaven master! I always enjoys your spins on challenges. 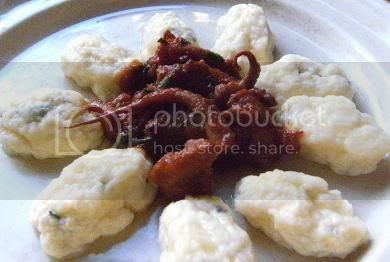 Thanks for stopping by my blog to comment on the ricotta gnocchi. I've put a link to your blog in my entry for the homemade ricotta -- thanks for posting that recipe in the DC forum! Oh Audax, I love what you did with the gnocchis... so many varieties and all of them look so pretty and delicious... I am about to go and buy a plane ticket to Australia and ask you to make me some! hahahaha. As usual, you are so creative and inspiring! I must must try to brown them as you did. And you are so right about the light flavor being versatile and able to take on bolder flavors as well as gentle sauces. I have to admit it was a bit of a thrill to have a DB/DC celebrity visit my blog! Thanks! FABULOUS...you did an awesome job & love the choice you offer here. Wonedrful job on the challenge. Yes, very right about bone dry ricotta! I lived & learnt, but made ricotta again for a lasgna, & bone dry is right indeed! Wow, wow, wow, wow, wow! I love each and every one of those flavor combos you came up with! Fabulous job on this challenge! Your gnocchi look absolutely divine, especially the fried dessert ones. I wish I had thought to make a sweet batch! It's fun to see what everyone else came up with... I'm very impressed with yours! Wow, I am beyond impressed at all your imaginative variations. I'd taste (and like) any of these! Great job. Amazing! And simply gorgeous! I am amazed at your talent and experimentation with flavors. 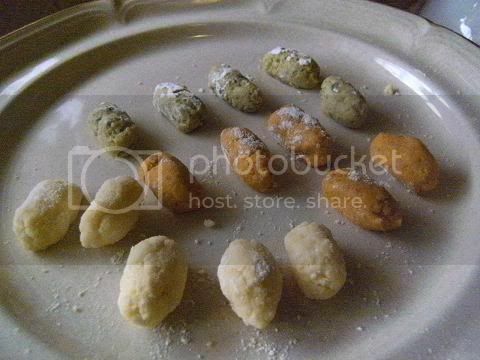 The savory gnocchi look perfect (and the 3 dishes just delicious) but I so want to try the sweet gnocchi. Wow! Perfect! I am always amazed by the quantity and variety you produce! Congratulations! Oh my gosh! That is just amazing ... I especially love the dessert gnocchi. Great job! Your dessert gnocchi sounds especially good! The roasted red pepper and pesto gnocchi look to die for! I will definitely have to try to make those sometime!!! Just amazing!..your speed is really something and so is your creativeness! too good!..